Watch NCJW CEO Nancy Kaufman in conversation with Elana Sztokman about the topic of women in Israel. The event took place on February 4, 2015 at the Museum of Jewish Heritage in New York City, and was aired on C-SPAN. Elana Maryles Sztokman, former executive director of the Jewish Orthodox Feminist Alliance (JOFA) and the author of The War on Women in Israel: A Story of Religious Radicalism and the Women Fighting for Freedom (Sourcebooks, 2014), explores Israeli women's struggles with the rules of the growing ultra-Orthodox movement there. >> "Why is it okay to discriminate against women for religious reasons?" >> At a sacred site, a fight over women and prayer"
Talia Kohen interviews Elana Sztokman about women in Israeli politics in advance of the upcoming elections in Israel, Part 1 and Part 2 below. And please share your comments and feedback. >> Could There Ever be a Female Prime Minister of Israel Again? Up Close looks at different ideas of feminine roles in morality, religion and politics. 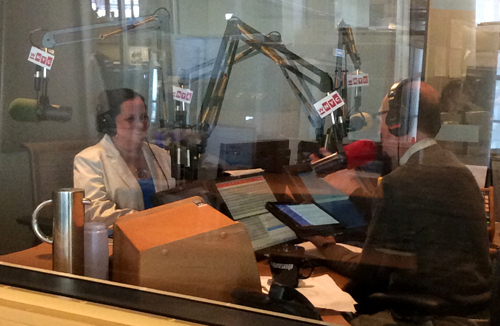 Steven I Weiss of the Jewish Channel interviews Elana Sztokman on women’s equality in Israel. 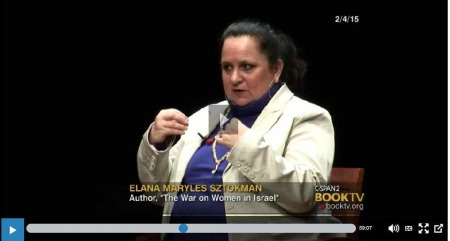 Jewish Orthodox feminist, activist, and author Elana Maryles Sztokman talks about her latest book, The War on Women in Israel: A Story of Religious Radicalism and the Women Fighting for Freedom. Elana Sztokman, former head of JOFA (Jewish Orthodox Feminist Alliance) was flying back to Israel after a tour promoting her new book, “The War on Women in Israel: A Story of Religious Radicalism and the Women Fighting for Freedom”, when an Ultra Orthodox man refused to be seated next to her because she was a woman. 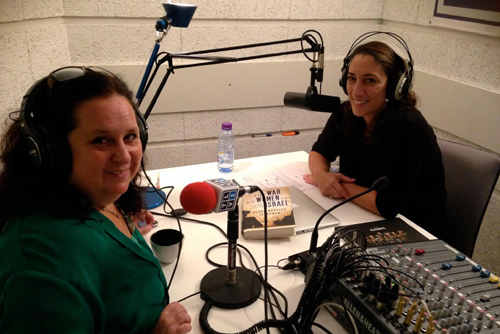 Mottle is joined in the studio by Voice of Israel show host Eve Harrow to discuss this incident and the larger implications of religious freedom in public spaces.